The patient is a 55 year old woman who had been diagnosed with a pelvic mass. The uterus, cervix, fallopian tubes, and ovaries were resected and the entire specimen was sent for frozen section evaluation. On gross exam, a 10 cm intramural mass was identified in the uterus. There were no other significant gross abnormalities seen. 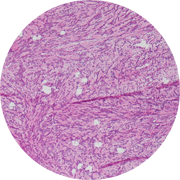 Representative sections of the mass were submitted for frozen section evaluation and no malignant neoplasm was seen. On permanent sections, the mass was noted to consist of a mix of adipocytes, smooth muscle, and collagen. No malignant features were identified. The findings are those of a lipoleiomyoma. Lipoleiomyomas are benign neoplasms that occasionally arise in the uterus. They are a rare variant of leiomyomas (benign smooth muscle neoplasms). Due to the presence of adipocytes (fat cells) they tend to be softer on gross examination than the standard form of leiomyoma.